Watching the Blu-Ray edition of Tim Burton/Henry Selick’s groundbreaking classic, it’s hard to believe it’s been 15 years. It doesn’t look a day over 10, or 5, or even 1 year old. It’s a timeless film which captures the essence of both Christmas and Halloween. It’s also my favourite animated film of the past 20 years. The story takes place in a city called “Halloweentown”, a funny little place inhabited by a group of people in charge of making Halloween scary. And Jack Skellington is the king of the scarers. He’s got the head of Beetlejuice, the grace and elegance of Fred Astaire, and the do-goodness of Jimmy Stewart. For Skellington, the monotony of scaring people for a living is starting to get boring though. During a stroll in the woods, he happens upon a door with a Christmas tree on it, which takes him to Christmastown, a place like Halloweentown, except where its citizens prepare for Christmas 364 days a year. Skellington is smitten with the joie de vivre of the yuletide spirit and decides to replicate it in Halloweentown. Unfortunately the townsfolk, nor Skellington, can grasp the concept, and so their Christmas tidings consist of reindeer made of skeletons and other frightening concoctions. Skellington’s solution is to kidnap Santa and take his place on Christmas night. But Skellington just can’t get the Halloween out of his system and it will take the real Santa to make things right, if it’s not too late. Though director’s credit is listed as Henry Selick, the world and characters comes from the head of Tim Burton. You can see dollops of "Beetlejuice", "Edward Scissorhands" and his short film “Vincent” in the art direction and design. In fact, on the Blu-Ray edition a full version of "Vincent" is available, in addition to a high definition transfer of his last short film, "Frankenweenee". It’s a remarkable look back at the beginnings of the great filmmaker. The art of stop-motion animation will never be replaced by computer animation. It’s been almost 15 years since “Toy Story” and it’s clear the two forms can live happily side by side – each give us a different cinematic experience which can't be replicated by the other. Look at the case of Aardman Studios, the British animators of “Wallace and Grommet", who recently vowed to go back to traditional claymation after the failure of their first and only CG film – “Flushed Away”. "Flushed Away" tried to recreate the claymation look with computer graphics, but it failed to replicate the magic of the organic process of the art. 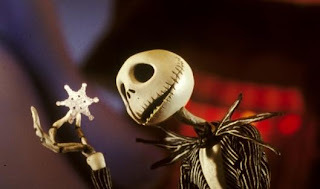 The strength of "The Nightmare Before Christmas" is in its detail, which is crucial to the discipline of stop motion animation. Everything in the frame is designed and meticulously worked by hand. Even the slightest movement in the background requires as much attention as the action in the foreground. And so, it takes several viewings just to catch everything in the frame. Some of the most delightful characters don’t even speak, or contribute to the narrative story. My favourite is the 'Igor character' who permanently has an axe stuck in his head. He wanders through the town and participates in all the activities oblivious to his gaping head wound. For me this comic absurdity sums up all the weird and wonderful characters in the Tim Burton universe. Stop motion is so completely different than traditional and computer animation because everything in the frame is a real tangible object. CG produces smooth elegant movement, but it’s the limitations and ‘flaws’ of stop-motion which give it it’s wonderful organic feel. That’s why the world of Halloweentown feels so real and lasting through these 15 years, and which is why I’ll always prefer a fake animated rubber suit puppet over a CG generated monster any day. By the end of Tim Burton’s career, he will be remembered for lots of great films – “Beetlejuice”, “Batman”, “Ed Wood”, Edward Scissorhands” but perhaps it’s “The Nightmare Before Christmas” which will be his definitive film - a truly unique lasting vision, and a treasure of the man’s full creativity. Enjoy.